condition of our soil both in America and worldwide, crop rotation and crop diversity is arguably the most important sustainable practice that local farmers use. By taking care to replenish the soil by planting certain crops in the off-season which add vital nutrients and minerals to the ground, they ensure that their land will produce the highest quality food year after year. For instance, many farmers plant legumes to add nitrogen back into their soil after being striped by other crops. In addition, many farmers who raise free range livestock use their green manure as fertilization for their soil, creating a symbiotic relationship between creature and matter. Farmer’s also bolster their soil in other ways such as companion planting, which is an organic method of planting crops together in such a way that supports and encourages growth, pest control, and natural fertilization through strategic planting. Some of the benefits of companion planting include, discouraging crop eating pests while attracting plant allies, possible higher yields of crops, better, taste and nutritional value, and planting two crops together in such a way that one protects the other by nature of its structure, as in planting tall sun-loving plants with lower shade-loving ones. One example of companion planting that I use in my organic garden is planting borage around my snap peas and tomatoes to attract bees and increase pollination, thus producing a higher fruit yield of my tomato plant.Another benefit of choosing farmers markets over conventional stores is that local farmers mostly use heirloom seeds versus using genetically modified or “GMO” plants. The benefits and implications of choosing heirloom over GMO are many, which is an entirely separate discussion, however, a few key advantages include, bee colony support which increases pollination, less pesticide use, less chance of allergens in food, and supports age old process and nature’s way of providing seed from a plant for next year’s crop. As you may have already deduced, most if not all of the sustainable practices mentioned support and benefit the environment. Sustainability and positive environmental impact (awareness) go hand in hand and work synergistically to ensure that we are not only affecting our planet in a positive way, but also that the next generation and those to come can enjoy the same benefits and resources that we do. One of the most obvious impacts that local organic growing farmers have on the environment is their limited use of pesticides as compared with conventional growers, which is largely due in part to utilizing many of the sustainable practices that have previously been discussed. The conservation of water, improving the quality of the soil, and recycling waste materials to use as compost and fertilizers are all self-explained environmentally friendly practices. The next most significant impact that local farmers have on the bigger picture of our National effect on the environment is through the minimal amount of greenhouse gases they contribute. By traveling much shorter distances to distribute their product, local farmers contribute a much smaller amount of greenhouse gases emitted during transport as compared to the large, sometimes cross-country distances that most food grown conventionally have to travel. Shorter (fewer) distances (miles) traveled to deliver their food results in less gas used, and also less dependence on oil. 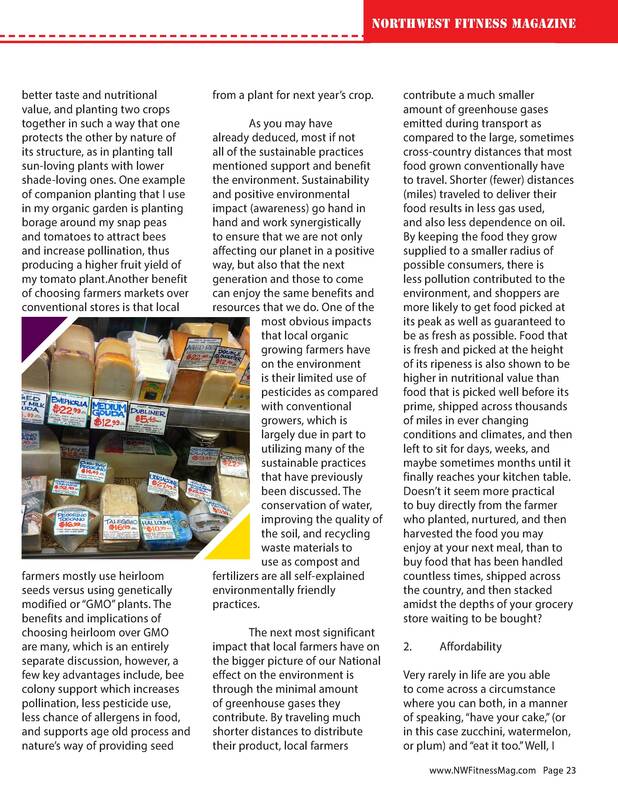 By keeping the food they grow supplied to a smaller radius of possible consumers, there is less pollution contributed to the environment, and shoppers are more likely to get food picked at its peak as well as guaranteed to be as fresh as possible. Food that is fresh and picked at the height of its ripeness is also shown to be higher in nutritional value than food that is picked well before its prime, shipped across thousands of miles in ever changing conditions and climates, and then left to sit for days, weeks, and maybe sometimes months until it finally reaches your kitchen table. Doesn’t it seem more practical to buy directly from the farmer who planted, nurtured, and then harvested the food you may enjoy at your next meal, than to buy food that has been handled countless times, shipped across the country, and then stacked amidst the depths of your grocery store waiting to be bought? Very rarely in life are you able to come across a circumstance where you can both, in a manner of speaking, “have your cake,” (or in this case zucchini, watermelon, or plum) and “eat it too.” Well, I am about to tell you that if you begin shopping at your local farmer’s market for even just a small percentage of your food, you will find such to be the case. Who would be opposed to scoring delicious, quality produce, dairy products, artisan foods, and other items at a better price than what one might find elsewhere, all while boosting the local economy and supporting local business and agriculture, what some may argue as the backbone of America. “If the farmer’s market is such a great value, why don’t more people shop there?” you may ask. 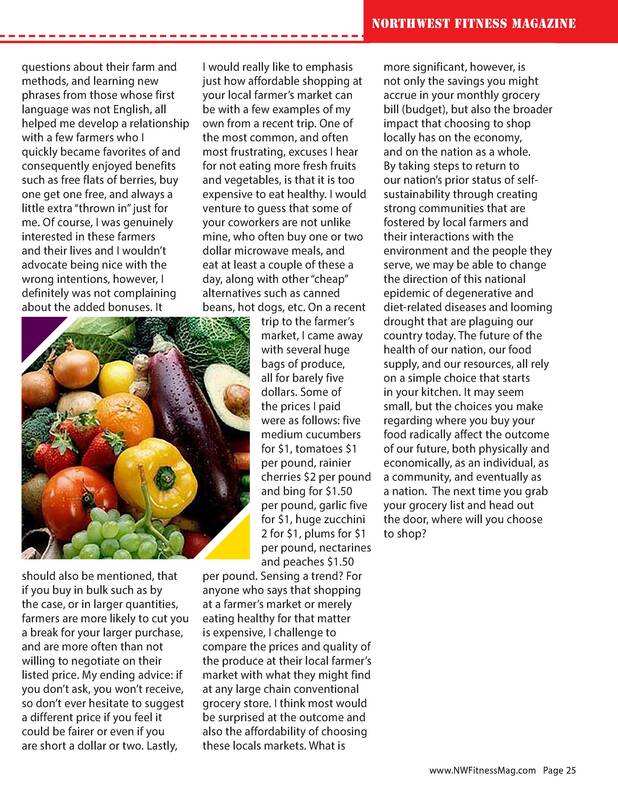 Well, the problem lies in that many are mislead to believe that farmer’s markets can be much more expensive than shopping at a conventional grocery store and that it is only for the very wealthy or “hippie” type people, when really quite the opposite is true! The farmer’s market is a great place to bring your entire family, and many markets even accept WIC, SNAP, Senior Vouchers, and other social programs. “Well I never carry cash, so I’d rather shop at the grocery store so I can use my debit card,” is a common excuse used against proponents of local markets, however, many markets are now accepting Visa and MasterCard transactions. Concerning the actual prices of the various produce and foods offered, most vendors sell at prices that are very comparable or often competitive to what you may see at the grocery store. 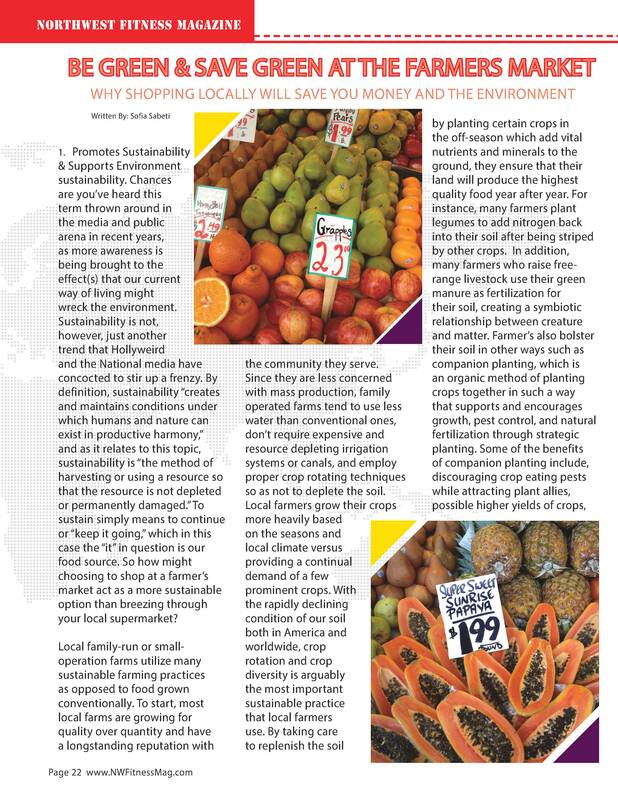 Since food travels less distance, the farmer’s themselves are often the ones who travel to the various markets, therefore cutting out the middle man and cutting costs even more for the consumer. Another method of scoring even greater deals at the farmer’s market is to first do a walk-through of the market, scanning the prices of all the vendors and seeing who might offer the best price for a particular item you are shopping for. Often, shoppers make the mistake of buying from the first vendor they stumble upon, but it is better to do a preliminary walk around and that way if you see a lower price elsewhere you can score a bit more savings, or be able to reference another vendor’s price list if you are up for a little bit of haggling with the farmers. The latter will also make the market experience a bit more exciting and give you a great sense of satisfaction if you are able to obtain a better deal than advertised to the rest of the market-goers. As your trips to the farmer’s market become more regular, you will start to develop a friendly relationship with the vendor’s from week to week, as it is not a rare occurrence for frequent market-goers to be on a first-name basis with their farmer’s. 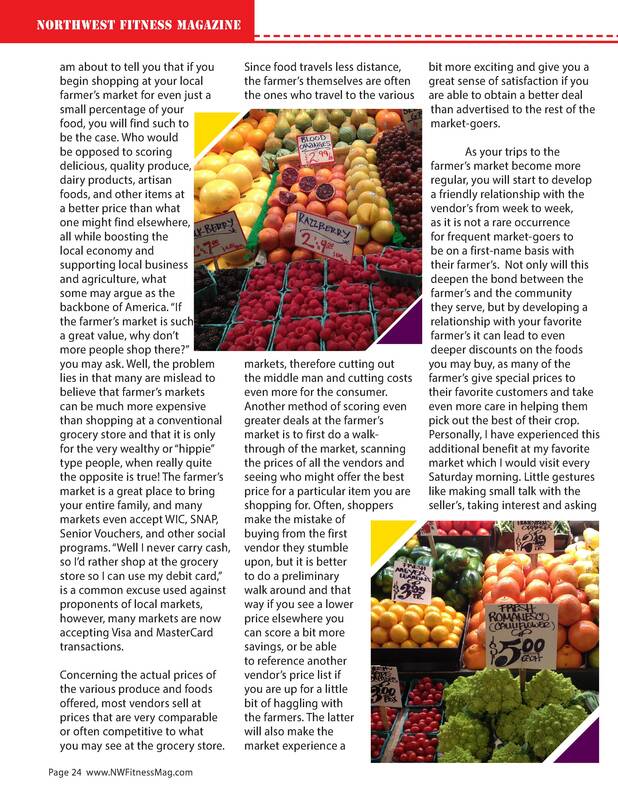 Not only will this deepen the bond between the farmer’s and the community they serve, but by developing a relationship with your favorite farmer’s it can lead to even deeper discounts on the foods you may buy, as many of the farmer’s give special prices to their favorite customers and take even more care in helping them pick out the best of their crop. Personally, I have experienced this additional benefit at my favorite market which I would visit every Saturday morning. Little gestures like making small talk with the seller’s, taking interest and asking questions about their farm and methods, and learning new phrases from those whose first language was not English, all helped me develop a relationship with a few farmers who I quickly became favorites of and consequently enjoyed benefits such as free flats of berries, buy one get one free, and always a little extra “thrown in” just for me. Of course, I was genuinely interested in these farmers and their lives and I wouldn’t advocate being nice with the wrong intentions, however, I definitely was not complaining about the added bonuses. It should also be mentioned, that if you buy in bulk such as by the case, or in larger quantities, farmers are more likely to cut you a break for your larger purchase, and are more often than not willing to negotiate on their listed price. My ending advice: if you don’t ask, you won’t receive, so don’t ever hesitate to suggest a different price if you feel it could be fairer or even if you are short a dollar or two. Lastly, I would really like to emphasis just how affordable shopping at your local farmer’s market can be with a few examples of my own from a recent trip. One of the most common, and often most frustrating, excuses I hear for not eating more fresh fruits and vegetables, is that it is too expensive to eat healthy. I would venture to guess that some of your coworkers are not unlike mine, who often buy one or two dollar microwave meals, and eat at least a couple of these a day, along with other “cheap” alternatives such as canned beans, hot dogs, etc. On a recent trip to the farmer’s market, I came away with several huge bags of produce, all for barely five dollars. Some of the prices I paid were as follows: five medium cucumbers for $1, tomatoes $1 per pound, rainier cherries $2 per pound and bing for $1.50 per pound, garlic five for $1, huge zucchini 2 for $1, plums for $1 per pound, nectarines and peaches $1.50 per pound. Sensing a trend? For anyone who says that shopping at a farmer’s market or merely eating healthy for that matter is expensive, I challenge to compare the prices and quality of the produce at their local farmer’s market with what they might find at any large chain conventional grocery store. I think most would be surprised at the outcome and also the affordability of choosing these locals markets. What is more significant, however, is not only the savings you might accrue in your monthly grocery bill (budget), but also the broader impact that choosing to shop locally has on the economy, and on the nation as a whole. By taking steps to return to our nation’s prior status of self-sustainability through creating strong communities that are fostered by local farmers and their interactions with the environment and the people they serve, we may be able to change the direction of this national epidemic of degenerative and diet-related diseases and looming drought that are plaguing our country today. The future of the health of our nation, our food supply, and our resources, all rely on a simple choice that starts in your kitchen. It may seem small, but the choices you make regarding where you buy your food radically affect the outcome of our future, both physically and economically, as an individual, as a community, and eventually as a nation. The next time you grab your grocery list and head out the door, where will you choose to shop?